Spain is a the third largest country in Europe with approximately 45 million residents that live in 17 autonomous communities and 2 autonomous cities (in northern Africa and on the coast of Morocco). The residents of these communities are as different from each other as the residents of the American states are from each other which makes traveling the country so interesting. There are also tremendous climate differences in Spain with the north well-known for rains that make the countryside green and the south splashed with warmth and sunshine on mediterranean beaches. In between, there are as many variations as there are weather reports..and within all of these regions are the Paradores of Spain. A parador is a hotel that is usually located in a historic building in Spain but there are also several in national parks, on golf courses and in seaside resorts (and a few modern ones). 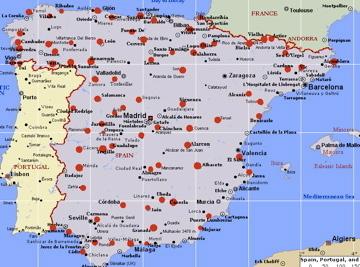 The first parador opened up in 1928 but the vast majority of the 93 paradores (see red dots on the map below) opened in the past 45 years. The paradores vary greatly but generally most of them are 4 and 3 star hotels whose rates vary from 70 euros ($95) to 300 euros ($400) per night. The original purpose of a historic parador generally determined a strategic location – the center of town or high on a hill – which make exploring a town easy and the views breathtaking. The location can also make driving to a parador a challenge because so many are in towns and cities that were built hundreds of years ago. When we drove into Caceres in the middle western part of Spain we had to maneuver streets that were built in the 14th century to get to the parador; after all, these streets were built for horses, not automobiles. The parador in Caceres is a palace in the center of the old town on top of a hill. I had to get out of the car and guide my husband as we went around hairpin turns where he literally had an inch or two on either side of the vehicle. But, the effort was worth it as the chance to stay in a piece of history is unlike a stay in any modern hotel. The parador in Careres had arched brick ceilings, an internal courtyard, exposed wooden beams and an outdoor garden that was the perfect setting for dessert – tecula mecula (a custard pie made with egg yolks, almonds, sugar and more) – after we walked the streets of the old town. Make reservations at the paradores. 34 90 254 79 79 (34 is the country code. If calling from the US, dial 0 11 first followed by the 34 and subsequent numbers). In Spain, many hotels charge by the person and add an additional surcharge for a second or more patron. Be specific when making reservations as room assignment is based on the number of persons in the reservation. There are no other taxes on your hotel bill as the VAT is included. Breakfast is usually included in the parador rate. No tipping is necessary but Spaniards generally leave the change or a few euros for excellent service. Children under the age of 12 are generally free. For the paradores, expect to pay approximately 32 euros ($44) per night (over the quoted rate) for each additional person over the age of 12. Most hotel reservations are held until 4:00 pm so if arriving later, advise the hotel of the expected arrival time. Spain usually operates on a 24 hour clock system where 4:00 pm is actually 16:00. For addresses, street names come first followed by the number. Zip codes come before town names. Paradores are great for exploring the country but are not recommended for trips to the largest cities – Madrid and Barcelona – as there are no paradores in the city limits. There are a few paradores that are 5-stars primarily because of the architecture and location. Although the service will be good, don’t expect the level of service of an American five-star hotel.